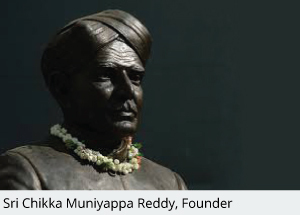 The CMR Jnanadhara Trust was established in 1990 as a tribute to the Late Sri Chikka Muniyappa Reddy, a visionary educationalist and philanthropist who believed that every individual deserves an education. He dreamt of bringing quality education to the masses. The journey started with establishment of the National Junior School (now CMR National Public School) in 1991. The CMR Group is a unique educational conglomerate consisting of K-12 schools, Pre-University Colleges, a number of institutions of Higher Education, various Centres of Excellence in Research and Development, and a Private University. 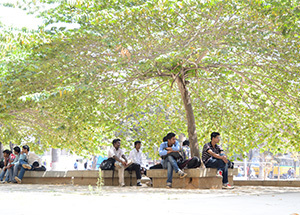 These educational institutions are located at eleven diﬀerent campuses across the city of Bengaluru, India. The Group caters to over 20,000 students from 60+ countries. Academic programmes are varied and cover more than 50 areas of study including engineering, architecture, commerce, economics, education, law, management, business administration, and psychology at the undergraduate, postgraduate, and doctoral levels. CMR aspires to be renowned for its delivery of quality education through its institutions of learning. We are guided by the belief that every person can achieve his or her dream if given a chance at a well-rounded education, and hence strive to inculcate the right values, scientifc temperament, and social commitment in our students, preparing them as trained professionals, inspired individuals, and genuine partners of progress. Committed to creating, building and providing value-added educational services through teaching, training, research, consultancy, and entrepreneurship within and beyond the curriculum through quality infrastructure, material and human resources to attain intellectual heights.